Alternative Data Group (ADG), a firm specializing in alternative investment data, launched the ADG API – a programmatic platform that gives clients an ability to automatically process raw alternative datasets, making it easier for institutional investors and vendors to safely extract structured company information and ensure a dataset free of Personally Identifiable Information (PII). With the launch of the ADG API platform, Alternative Data Group is demonstrating its capability as a premier provider of algorithmic data solutions for the growing alternative data industry. The new ticker mapping service is a direct result of four years of artificial intelligence development into the domain of structuring raw data. The unique combination of machine learning systems and live graph databases allows ADG’s mapping to reflect the daily updates in M&A activity and ownership structure. The companies identified by the API are merchants, manufacturers, hotel chains, subscription service providers, and many others, as well as their parent entities. Datasets such as credit card transactions, email receipts, and clickstream data could be used with the ADG platform. Merchant mapper – tagging company names and tickers to unstructured text such as credit card data or email receipt data. Domain mapper – identifying company names and tickers from domain URLs. PII identification – detecting any personally identifiable information in unstructured text such as credit card transactions. IDSO compliant. ADG is planning to augment its API offering with panel selection, trend detection and other tools scheduled for deployment in Q4 2018. ADG’s launch of its new alternative data API platform is an extremely interesting addition to the alternative data landscape as one of the real problems users have in using “exhaust data” is that the owners of that data often don’t have the domain knowledge to map the data to tickers or to remove PII from the dataset. This API would also be useful to format raw data collected by the client directly, including web scraped content. 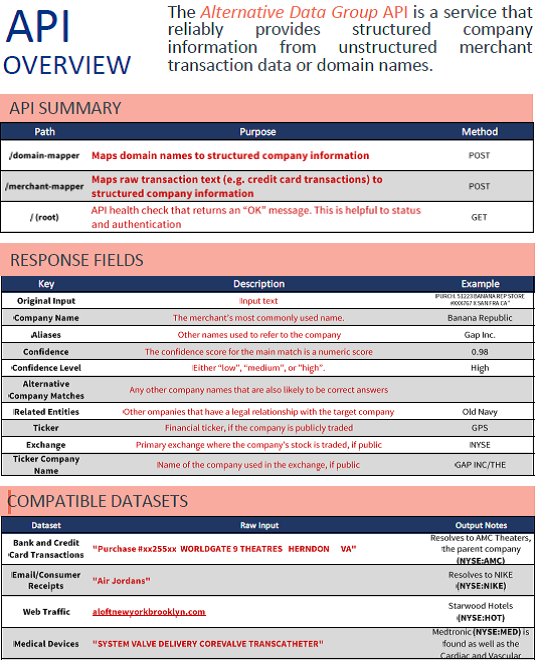 The new API tool is particularly relevant for credit card transaction data, e-mail receipt data, and text-based web data. As an exclusive offer to Integrity ResearchWatch readers ADG is offering a discount code “IntegrityResearch_ADGAPI2018” which will enable users to receive $300 off the first month’s fees if they subscribe to the API and use the code in the promo code dialog box. Depending on the package of services chosen, a client would pay between $500 per month to $1,000 per month. The rebate will appear on their first month’s statement. The discount code will be valid for 30 days from today (09/26/2018).